In the fall of 1957, a group of University of Delaware Library supporters met to discuss ways in which they could provide financial assistance to enable the Library to acquire books, manuscript and other material to support research and teaching. The result of this meeting was the founding of the University of Delaware Library Associates, which, in April 1958, was formally established as a not-for-profit organization whose mission was to help build the research collections of the University of Delaware Library. The work of the University of Delaware Library Associates has had a profound impact on the growth of all areas of the University of Delaware Library over the past six decades, but perhaps the organization's most enduring contribution has been the support it has provided for the University of Delaware Library's Special Collections. From the very outset, the Library Associates identified the development of the Library's research collections as a top priority. In particular, the Library Associates sought to enrich the Library's research holdings in some of the fundamental disciplines of the humanities, notably English, American, and Irish literature; art and architecture; history; the history of science and technology; horticulture and landscape design; and all aspects of history and life in Delaware. 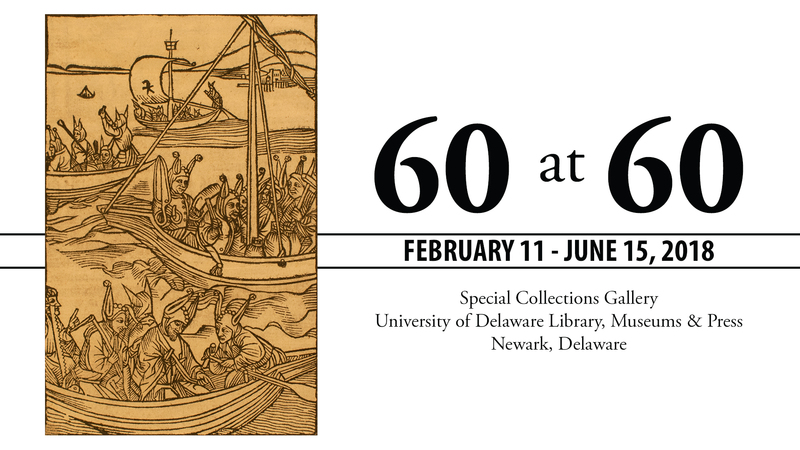 The exhibition “60 at 60” celebrates the sixtieth anniversary of the University of Delaware Library Associates by presenting sixty books acquired between 2008 and 2018 with financial assistance from the University of Library Associates. Curated by Timothy Murray, Head of Special Collections, the exhibition includes a broad range of material on a multitude of topics reflecting the breadth and depth of the University of Delaware Library’s holdings. By focusing on a single decade of acquisitions made between 2008 and 2018, “60 at 60” offers a remarkable sample of the magnificent research collections the University of Delaware Library Associates have helped develop over the past six decades. The Library staff who have had the opportunity to work with these collections have strived to remain true to the original goal of the Library Associates to acquire primary research material in a broad range of humanities disciplines and make it available to the faculty and students of the University of Delaware and to the world-wide scholarly community.